Second version of the miter shooting board, per Paul Sellers' article. Paul Sellers did a blog post on his shooting board that provided some additional information. It also turns out he had a very nice article on the subject in the December, 2006 issue of Popular Woodworking, along with a PDF containing expanded information available for download from the magazine's website. When I saw the PDF, I realized I had seen it before, but had lost track of it. I dug out my copy of the magazine and made another shooting board according to the article. I used poplar for this one, which is a little harder to work than the pine. The tapered wedges for the stops kept slipping in my vise when I was forming them with the chisel. This version maintains the same orientation of the miter wedges as the last one I made, since that's what Paul described in his article. While that differs from what I've seen in other books, it's simply a different design. It also has two 90 degree shooting positions, so it requires one wedge cut at 45 on the end and one at 90. You move a wedge to the matching recess to shoot the opposite angle. One challenge is that it's tricky to get identical recesses for the wedges. It's easy enough to just make four separate wedges. The reason for the tapered stops in the first place is to allow them to be trimmed as they get chewed up over time. Then just take a swipe off the taper with a plane and tap them back into place. The recesses on the shooting board need to be cut precisely, so it's worth trying a couple for practice. Even with a perfectly made board, you still have to be careful handling the plane. Once again, I've made a sped-up video so you can see the process without falling asleep. Heck, that is my normal sawing speed! Great video. Steve, doesn't it drive you crazy to have those angled wedges moving in your vise when chiseling them out? Any reason that happens? Superb video, Steve. Love the speeded-up sounds of the tools, too - my wife thought I was watching a natural history film with woodpeckers and gnawing rodents! When I first put the other video together and tried out the fast-forward on a couple parts, it really cracked me up, so I decided to do the whole thing that way! I think the end result makes for an effective and entertaining way to cover a longer process. Shaun, I didn't have the vise cranked tight enough. Since the poplar is a harder wood than the pine I used before, I had to hit the chisel harder with the mallet, making the piece move. Many people line their vise chop with leather or sandpaper for exactly that reason, to improve the grip. Some people use non-skid shelf liner, which is what Paul Sellers does (he just wraps it loosely around the piece in the vise). 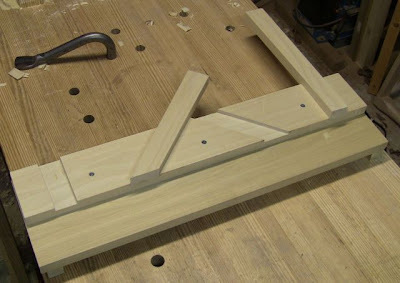 I also could have put the pieces on the benchtop, between the planing stop and my Veritas Wonder Dog. It was a bit of a nuisance, but I tend to work with a minimum of clamping for speed, so I'm used to things moving a bit. Just knock them back in place or tighten things down and keep working.